Last Saturday I stopped at my favorite store here in Puerto Rico: The Scrapbook Store. My friend Yamille had just gotten back from CHA, and guess what? Christmas had arrived!! (Yes, I said Christmas...) Lots of papers and Christmas kits, buttons and glitter... gorgeous! This made me start thinking of the decorations, gifts, cards and albums I have to make before Christmas arrives this year. So, I hit the web to check out the new trends. That's how I found this great idea: a 6 foot-tall paper Christmas Tree! I LOVE it!!! 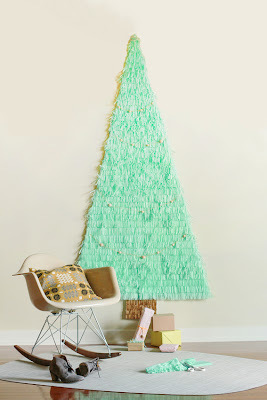 Brittni from Curbly, has a great tutorial on how to make this gorgeous tree. I was thinking you can decorate it with recycled, diy ornaments for an even more eco-friendly Christmas. What do you think? Would you do a paper Christmas Tree this year? I think I am!